We’re getting dangerously close to the holiday season. Thanksgiving is just a week and a half away, and then it’s time to dive right into the rest of the winter holidays! It’s prime gift giving season, which means Santa needs to start making his list and checking it twice, very soon. Sure you’ve got ideas for the major players in your life, but what about the little people too? The neighbor who always rakes your leaves or shovels your driveway? The mailman who delivers, rain or shine? A teacher? A boss? The friends and family who live far away, or the ones you’ll visit close to home? It’s the season to say thanks and show how much you care. And what better way to express those feelings than something homemade. That’s why this year, for my annual holiday post series, I’m sharing ideas for Handmade Holidays! From food to crafts, there’s something for everyone, near and far! First up, a little something to pack in those cookie care packages to ship to family and friends around the country. 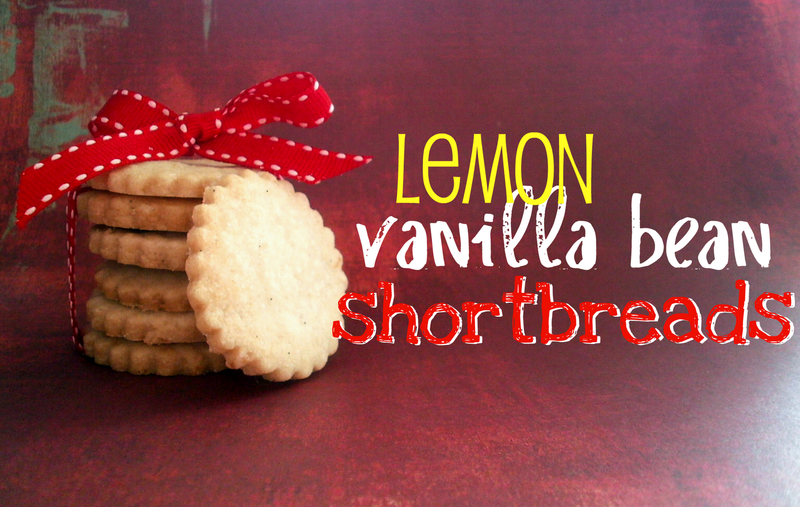 Shortbreads are perfect for the holiday cookie package. Crisp and sandy, they can handle a few days in transit without losing their delicious buttery flavor. While, honestly, I’ve never been the biggest fan of shortbread (I like my cookies soft and chewy), I have to say I’ve eaten a shameful amount of these. And I’m well on my way to being a shortbread convert too (along with apple pie and baked fruit. This is apparently the year of changing my mind about food!) Flecked with vanilla bean seeds and kissed with just a hint of lemon, they’re the perfect bite-sized treat. If I can tear myself away from nibbling them as is, I might even dip the rest in chocolate for an even more irresistible treat. What kind of cookies will you be sending in your care packages this year? And what tips do you have for getting them there in one piece? 1. Preheat oven to 325F. Line two baking sheets with parchment paper or silicone liners; set aside. 2. In the bowl of an electric mixer, cream butter, sugar, lemon zest, and salt. Add scraped vanilla beans and beat on medium speed until light and fluffy, about 5 minutes. 3. Remove bowl from mixer and, with a rubber spatula, fold in flour by hand. 4. Turn dough out onto a lightly floured work surface and pat into a large rectangle. Divide the dough in half. Working with a half at a time, gently roll the dough out to ¼-inch thickness. Use a 1 ½-inch cookie cutter to cut out shapes, placing them on prepared baking sheets 1 inch apart. 5. Gather the scraps and reroll with other half of the dough, repeating until all dough has been used. 6. Bake cookies, rotating pans halfway through, until edges just begin to brown, about 14 to 15 minutes. Transfer to wire racks to cool completely. These look heavenly. I bet they'd be good half dipped in melted white chocolate too with some festive sprinkles! This is definitely my year of giving cookies as gifts. I think I'm going with Vegan Sugar Cookies, No Bake Cookies, Peppermint Sticks, Iced Ginger Cookies, Vegan Pinwheels and your Mocha Meringues! And these are perfect for an egg, peanut and treenut allergic child (like, say, my son) AND his entire, non-food allergic class and teachers. THANK YOU!